Ayurveda is founded on the belief that true health is everyone’s birthright—and that each of us is a self-healing entity who can use nature’s abundance to restore and renew ourselves. Ayurveda Lifestyle Wisdom is a breakthrough book for yoga practitioners, spiritual seekers, and anyone ready to learn a "doable" approach to this time-tested art and science of health and well-being. 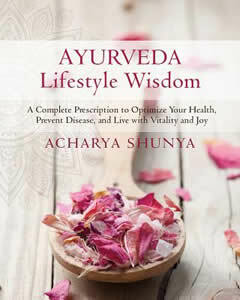 Internationally renowned for her ability to make Ayurveda accessible and practical for Western audiences, Acharya Shunya presents a narrative-based guidebook that meticulously covers the how-to’s of morning and evening self-care, daily contemplations, self-massage and skin care, cooking (including recipes), beauty rituals, and more. "To rid ourselves of the suffering that afflicts the body, mind, and soul, what we need is an affirmative knowledge of life and how to live it in alignment with nature," writes Acharya Shunya. Ayurveda Lifestyle Wisdom opens the gates to this profound knowledge.